Welcome to Little Red Robin.... 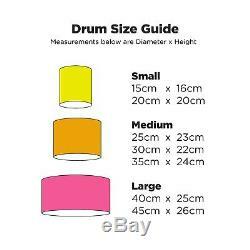 Listed here is a handmade fabric drum lampshade with a leopard animal print with a hot pink fabric lining to add a pop of colour. Suitable for use with a ceiling fix and a lamp base. Diameter 20 cm / 8 Height 20 cm. Diameter 25 cm / 10 Height 23 cm. Diameter 30 cm / 12 Height 22 cm. Diameter 35 cm / 14 Height 24 cm. Diameter 40 cm / 16 Height 25 cm. 20 cm - perfect for bedside table or a small sized room as a ceiling fix. 25 cm - a little in between! Will suit medium lamps and medium sized room as a ceiling fix. 30 cm - by far the most popular! Suitable for most table lamps / floor lamps and as a ceiling shade in any size room. 35 cm - Suitable for larger table lamps / floor lamps and as a ceiling shade in any size room. 40 cm - makes a real statement! Suitable for larger floor lamps or medium / large rooms as a ceiling shade. Made by Little Red Robin using professional materials including flame retardant PVC that meets UK standards. Supplied with a European converter ring and low energy light bulbs recommended. Due to the layers of materials used in making this shade, the lining does not allow the light to shine through the sides only from the top and bottom. This shade will glow with a lovely warm colour. 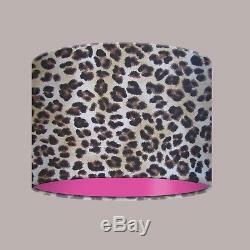 The item "Leopard Animal Print with Bright Pink Lining Drum Lampshade Kitsch" is in sale since Saturday, February 17, 2018. This item is in the category "Home, Furniture & DIY\Lighting\Lampshades & Lightshades". The seller is "littleredrobinco2012" and is located in Kinver, West Midlands. This item can be shipped to United Kingdom, Austria, Belgium, Bulgaria, Croatia, Cyprus, Czech republic, Estonia, Finland, France, Germany, Greece, Hungary, Ireland, Italy, Latvia, Lithuania, Luxembourg, Malta, Netherlands, Poland, Portugal, Romania, Slovakia, Slovenia, Spain, Sweden, Australia, United States, Canada, Brazil, Japan, New Zealand, China, Israel, Hong Kong, Norway, Indonesia, Malaysia, Mexico, Singapore, South Korea, Switzerland, Taiwan, Thailand, Chile.